Anyone for a Peanut Butter Muffin? The first recipe for my blog is one from a book I found while wandering around Sainsbury’s Supermarket. Very simply entitled “Home Baking Cookbook” – Consultant Editor Jacqueline Bellefontaine, this unassuming book, for me, holds many treasures! The recipe title in the book is Fudge Nut Muffins, but as I had no fudge, well… new title.. and slight tweaking to suit what ingredients I had to hand. First of all, you will need to pre-heat your oven to 200C/400F/Gas Mark 6. Fill your tin with 12 cases. Sift the flour and baking powder together in a large bowl. Add sugar next and combine. The add the peanut butter, and rub the mixture through your fingers as you would for scones, until it resembles fine breadcrumbs. Whisk the milk, vanilla extract, butter, and egg together in a separate bowl or jug, and then add the wet ingredients to the dry. Mix gently, taking care not to overwork the batter. Using two dessert spoons (one to scoop up the mix from the bowl, and the other to scrape the mix into the cases) fill the cases. 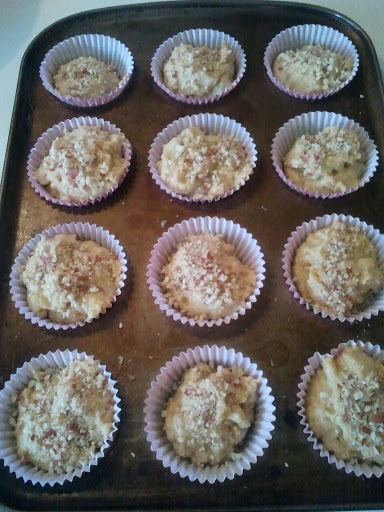 Scatter the top of each muffin with the chopped peanuts. Bake in the centre of the oven for between 20 and 25 minutes. Test with a cocktail stick or metal skewer to make sure they are cooked through. Remove from the oven, and leave to cool on a wire rack. Next Post Where it all began…..